Last fall we collected baskets of apples off our trees. In November with warm days and cool nights the apples celebrated. They got fatter and sweeter. I love picking the fruit from low-hanging limbs, shining the smudge off, and biting a chunk out of the sweet red ball of fruit. My beard would get sticky from the juice that squirted out as I crunched bites. But that was last year. Today when the rain moved off to the north and the sun ventured our for a short stay, I walked down to the garden. I walked around the apple tree twice and only saw a few apples. Jilda called her sister Nell who is a garden guru, and Nell said that it was not uncommon for a fruit tree to take a rest. Thinking back to years past, it occurred to me that it deserved a rest. The strep knocked the wind out of me. I felt a little better today, but it may still be a while before I go dancing. So I spent the day resting. I didn't write, do any work other than practice for our upcoming gig, but that's not really work in my book. I think a days rest is just what I needed because I'm feeling stronger. May is winding down. I hope the month has been kind to. June is the halfway mark for this year. There you go, as I read it my jaw did a little lock up wanting a bite of a crisp apple. I love apples from the time they are an inch and green till they are ripe. Mama used to dry them on an old piece of tin roofing for pies later. Glad you are feel a little more fit. It's good to know you are feeling better. 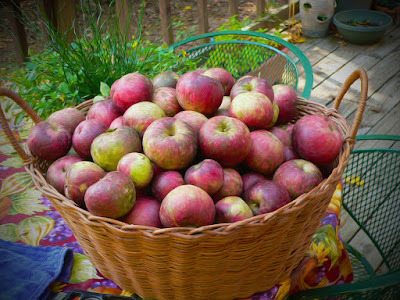 Bushels of apples always meant pies, cakes, apple butter, and baked apples. Hmmm. I'm hungry. I've heard that about fruit trees. Strep is a mean bug/sore/sore/sore/throat etc. to have. Our apple tree (singular) does that too, one year wonderful and abundant apples and another nada. Take care of yourself. Everything does have it's season and time and rest sounds like just what you needed. Hope you are better each day now. Ooo, I was kind of excited to see the apple basket. Brought memories of my Momma and Daddy's backyard apple trees when my girls were young. We would gather and make wonderful clear apple jelly. "Sweet" memories! I can taste those apples. And "shining the smudge off" is one of the best descriptions I've ever heard. I've done that to an apple many times, but now I've got a name for it. Resting is good. Getting rid of strep is even better! I hope you feel much better soon. The first half of the year has gone by so quickly. Take good care of yourself. So fruit trees are smarter than humans?! I know we push ourselves to accomplish so much and get mad at ourselves when we can't do it all anymore. Resting, sleeping, stepping down or away and taking a deep breath are so important. Strep is no walk in the park so please rest up and don't push it. I hope your weekend is good and your health even better! time sure does fly . My favorite apples are McKintosh.In the fall we'd go to the orchards and pick them . I hope your health & your apples come back soon!! Apple trees, how I wish they were in my yard, if I had one with water! Last year my lilac bushes bloomed three times: April, June, and October. Why? Now they are "taking a rest", which is good advice all around.